March 23rd, 1932 was the date of the baptism of Helen Josephine Irwin, when she became the 1,000th member of the church which had been formed in 1867; we all call her Jo, and she was a part of 1st Baptist of Franklin even before her baptism at 13, soon after her parents moved here when she was 4 from where they had lived by Cooks Forrest. Jo has been a part of 1st Baptist through the tenure of 13 pastors (and 4 interim pastors). She was here when the church, town, and county were booming, and she's been here during the times of decline. In her early years, Jo enjoyed being a part of church plays, loved being onstage, and causing what in those days was considered to be a ruckus with her friend Lawanda Baker, who was born just over a month before Jo, and went home to glory on August 27th of 2017 after 98 years. Jo taught Sunday School when 1st Baptist's 2nd longest tenured member was in the class, 88 year-old Lois Ann Schaeffer. She married a classmate, Chester Beach, on August 28th, 1939, they had two daughters, Carol and Penny. Chester preceded Jo, on February 9th, 2002, after 62 years of marriage. Jo still speaks of Chester, the love they shared is readily apparent. Through it all, through the good times and the hard, Jo has brought a light-hearted attitude and an understated but hilarious sense of humor to the life of the church. 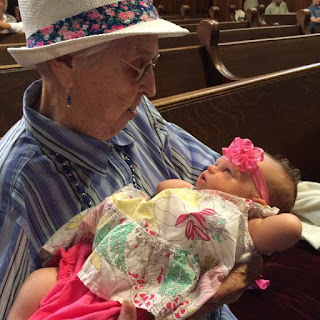 In her later years, Jo's eyesight deteriorated, but it didn't get her down, she has consistently emphasized how blessed she is, and has been, in life, and how good to her and important to her, the church and its people have been. She told me that she liked the old hymns best, because she could sing them by heart since she couldn't see the words anymore. Nearly everyone at 1st Baptist has a Jo Beach story, most of them funny, it is our honor to wish her joy (which she already has in abundance) on her 100th birthday. We love you Jo.